Andy Peaks insists AFC Rushden & Diamonds are “still in there and fighting” for a play-off place after they made a welcome return to winning ways. Goals from Declan Rogers and Jack Bowen helped Diamonds fight back from a goal down to earn a 2-1 success over Needham Market at a windswept Hayden Road as they ended a run of three games without a victory. 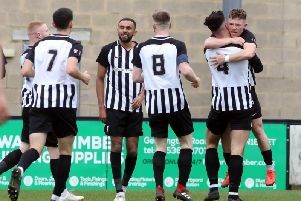 The result sent Peaks’ team back into the play-off positions in the Evo-Stik League South Premier Division Central with seven games to play. And, despite some teams around them having matches in hand, Peaks insists there is still plenty of belief in his squad after they turned in a solid defensive display to secure the points with all the goals coming in the first half. “It’s a seven-game season and we will take it one at a time,” the Diamonds boss said. “I keep saying to the boys that they just need to win their games and put in the performances and we will see where it takes us. “It’s just about us. As long as we put a shift in and pick points up then we know we will be in and around it. “This was a big test for us after two defeats that were harsh on the boys. But we are still in there and fighting. “It was all about getting the result, it was never going to be a classic and it was about us coming out on the right side of a tough game in tough conditions. “We needed to bounce back and the lads have still got the belief and I thought we started well. “They scored a free-kick out of nothing and that could have sucked the confidence out of us but we reacted well and to score so quickly and then take the lead before half-time was a massive positive and it showed a lot about the character within the group. Peaks was pleased to see striker Bowen grab what proved to be the winner with a looping header four minutes before half-time. The frontman has started the last two matches ahead of top scorer Tom Lorraine. And the Diamonds manager added: “Jack has been excellent after coming back into the team in the last two games. “He has had to wait for his chance because Tom has been playing so well. “But it’s a squad game, those two are good mates off the pitch, they respect each other and they want each other to do well.